To be honest, there will be more than tortellini today, but the title was too awesome to pass up on. Today’s theme is fresh pasta, and since that’s one of a number of foods that’s much more fun to make in company, I’ve enlisted the help of my better half – hence the tag team. 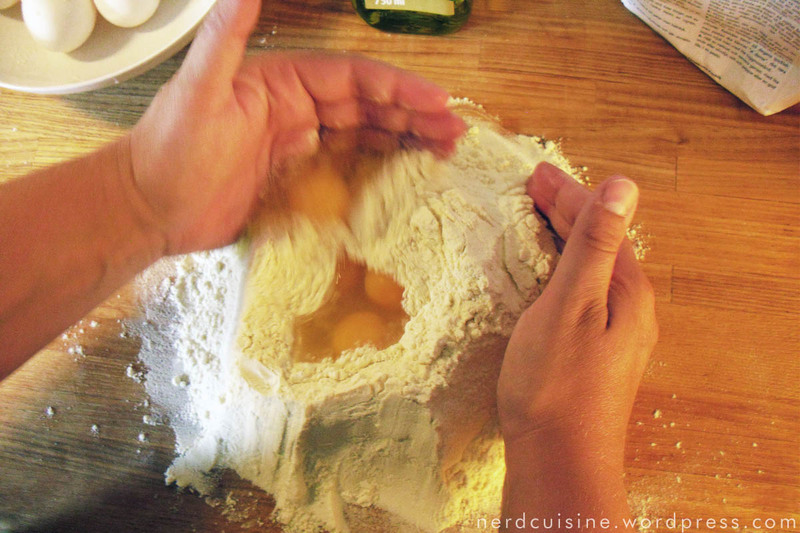 If I remember correctly, we talked about making our own pasta after watching an episode of MasterChef USA, season 2. I bought a pasta machine at a flea market almost ten years ago and while it’s been used for pasta once or twice, I’ve mostly used it to shred newspapers to use as playing/nesting material for pet rats. The last rats died years ago and the machine has been collecting dust until now. First, one needs dough of course. Recipes vary concerning whole eggs or yolks, flour mix and other stuff. We used whole eggs and durum wheat flour. 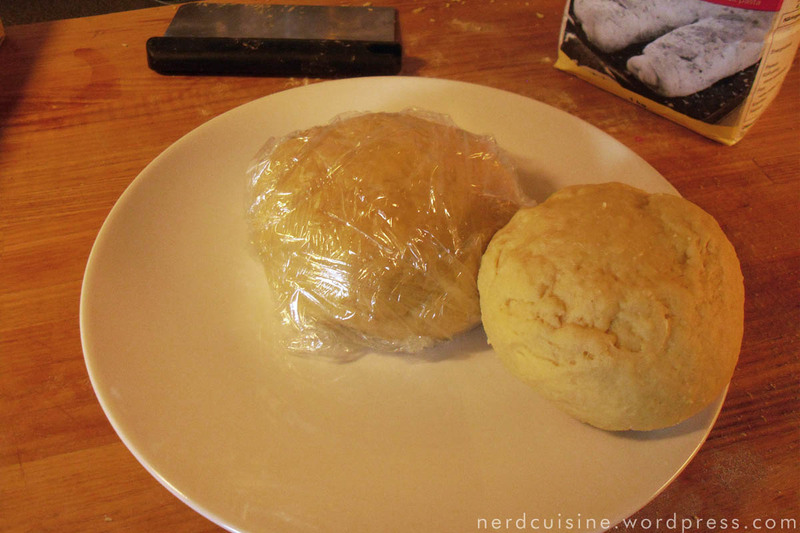 Dough kneaded and one lump wrapped in plastic. As soon as both were wrapped they went in the fridge to rest while we shopped for filling. Here’s some of the dough, machine-rolled out. 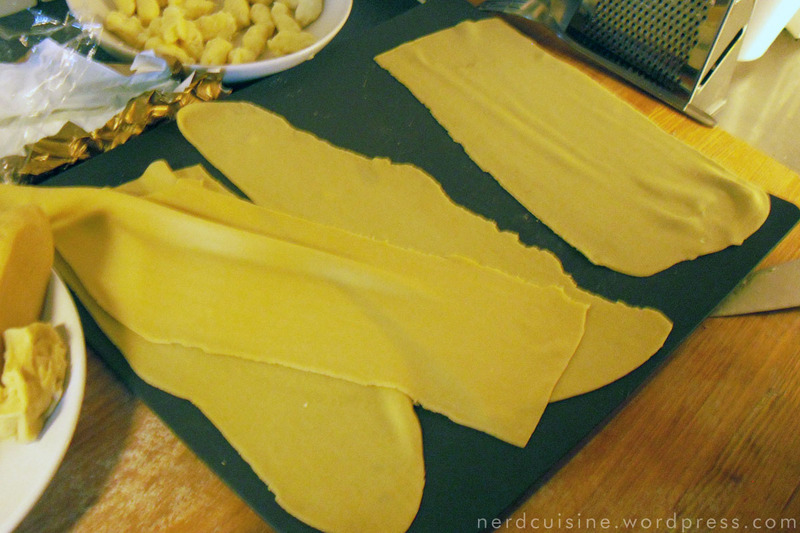 I’ve pin-rolled pasta dough once and I hope I’ll never have to do that again. It was no fun at all. 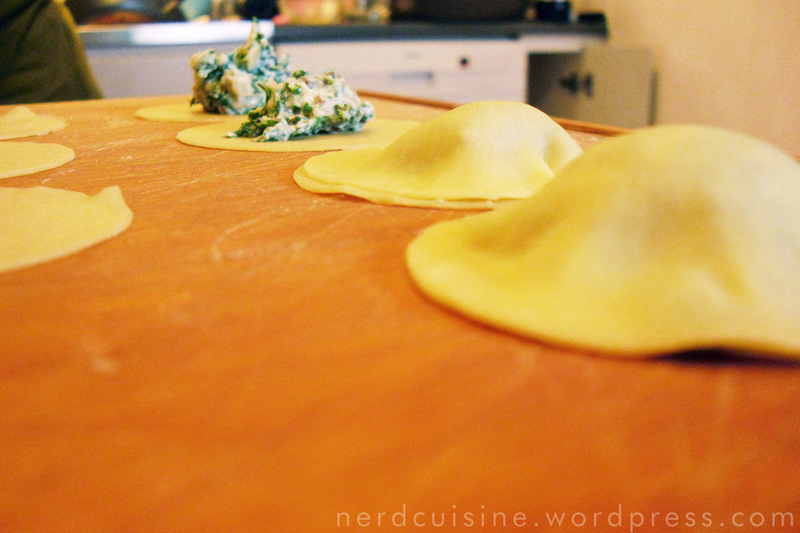 We had planned to make two types of pasta, tortellini and ravioli, with different fillings. 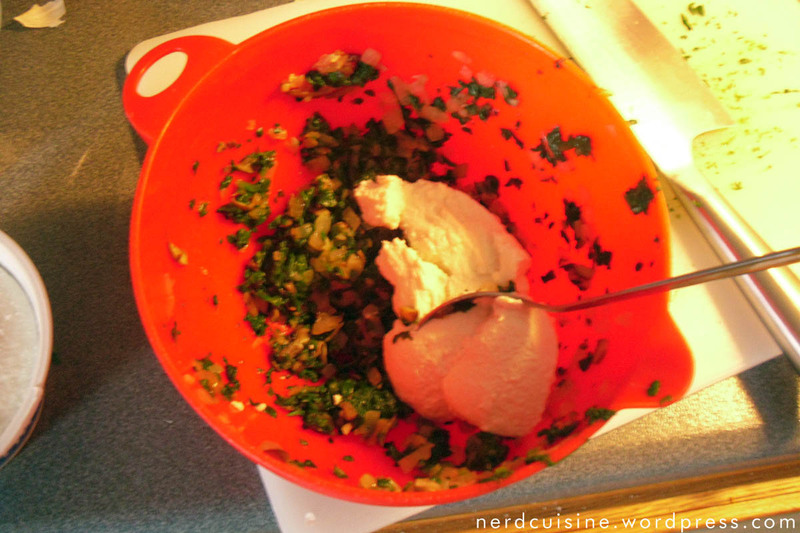 The little lumps in the bowl in the picture are filling #1, which is a mix of Brie and Grana Padano. A yummy all cheese filling for the tortellini. 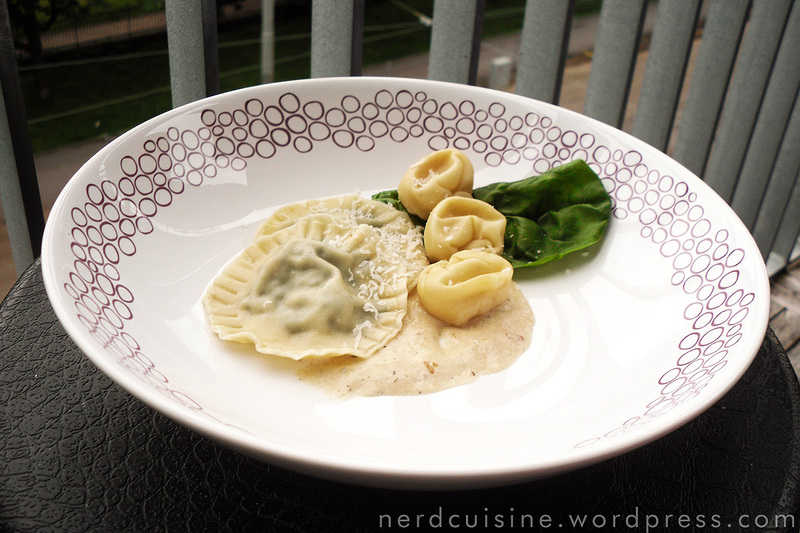 Here’s what I did for filling #2 – a slight twist on the very classic spinach/ricotta ravioli filling with fresh spinach, blanched and chopped, together with ricotta and sautéed onions, garlic and mushrooms, seasoned with white pepper, thyme, a hint of nutmeg and a couple of drops of truffle oil. Some of the pictures in this post are rather crappy, because we were really hungry and didn’t quite have time for more shots. 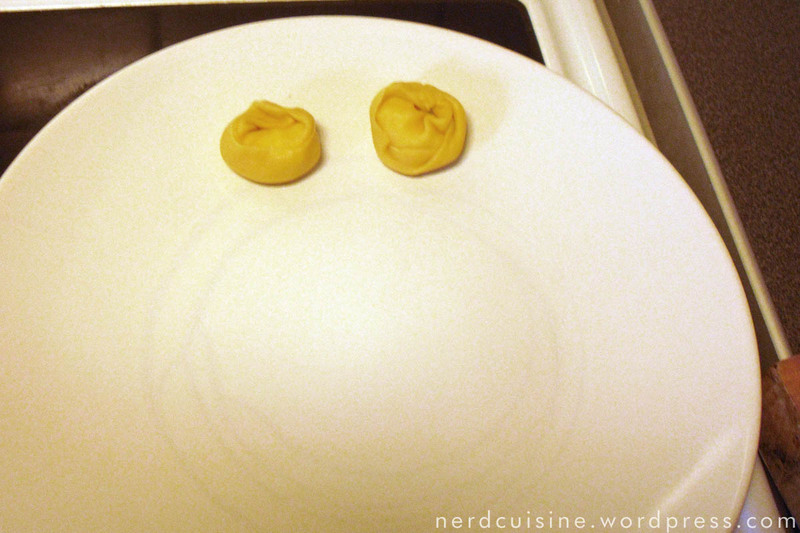 The ravioli required two pieces of dough and had a much looser filling, which made manufacture rather slow. 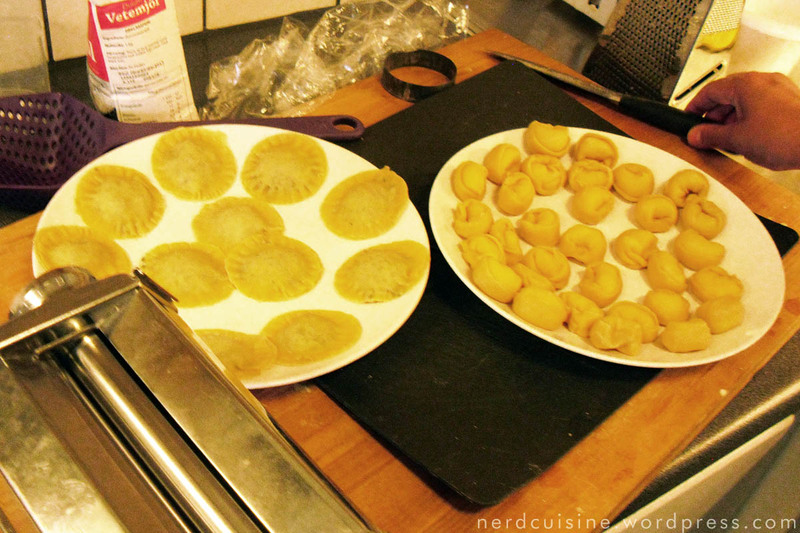 A bit over half the ravioli and all of the tortellini done and having a rest before cooking. 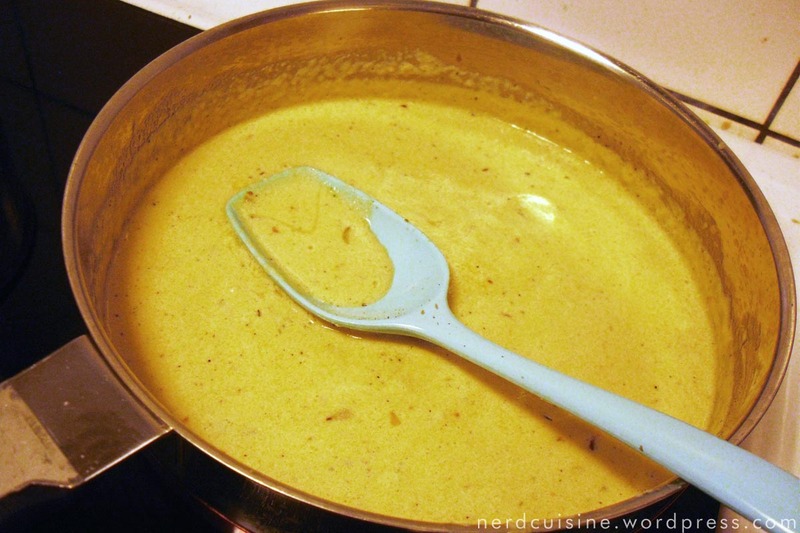 With the pasta resting, we whipped up a sauce of roux, cream, a splash of balsamic vinegar (white wine would possibly be a better choice, but we didn’t have any), a small amount of very finely chopped and caramelized onions and a bit of grated Grana Padano. 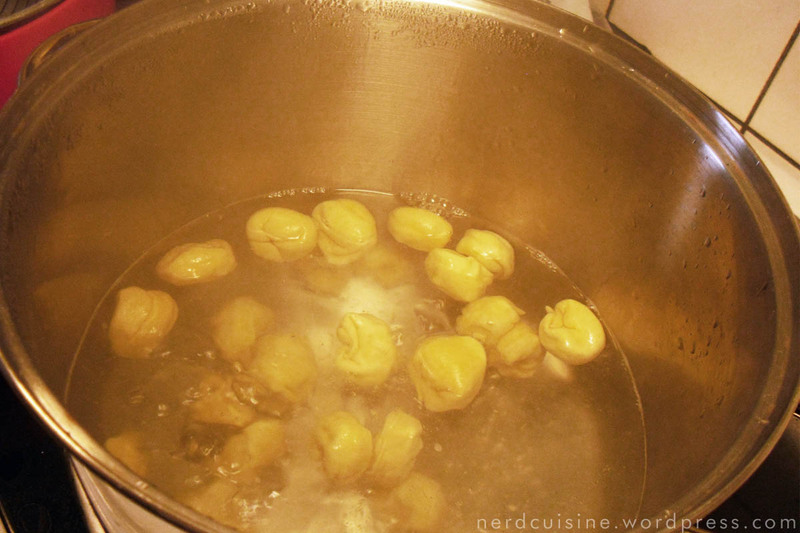 With the sauce simmering, we started boiling the pasta. Dish completed and plated prettily. Pasta made from a half batch of dough, in turn made from 450 grams of durum wheat flour and six very small eggs, evidently feeds two starving 30-year olds to a near comatose state. The other half of the dough is in the fridge, biding its time. This entry was posted on July 6, 2012 at 02:31 and is filed under cheese, italian, pasta, sauce, vegetarian with tags dinner, main course. You can follow any responses to this entry through the RSS 2.0 feed. You can leave a response, or trackback from your own site.